Currently, the dominating form of energy storage is the lithium-ion battery. Lithium-ion batteries work by storing energy electrochemically. 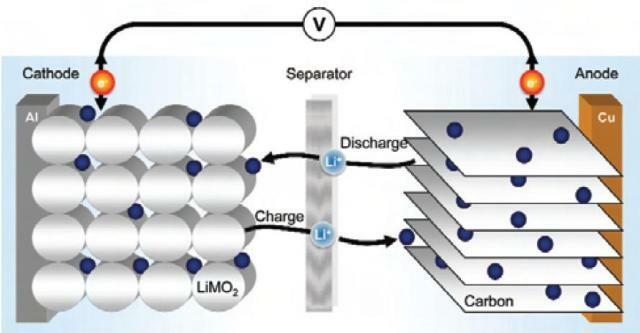 When charging your battery, electricity moves the lithium ions to a material called the high-energy anode compound. During use, these energy-filled lithium ions travels from the high energy anode through a separator, to the low-energy cathode material. This process releases the energy, which is then extracted into a circuit. Overtime, this cycle of charging and discharging causes the chemical compounds of the battery to slowly degrade. As a result, the battery will hold a lower power density and lose its ability to store energy. Supercapacitors work differently than batteries. With supercapacitors, energy is stored electrostatically on the surface of the material. No chemical reactions are involved. Supercapacitors charge quicker and provide a higher power density. Moreover, supercapacitors do not lose their ability to store energy over time. The drawbacks of it are that the materials used to make supercapacitors are more expensive and about 10 times larger than batteries for a given charge. Because traditional lithium ion batteries degrade over time, especially when exposed to constant heat, we recommend getting a dash cam with a supercapacitor as it is much more durable and reliable given the conditions inside a vehicle year round.